Do you isolate yourself in social settings because you are insecure about your imperfect teeth? You are not alone. In fact, as much as two-thirds of adults dislike theirs as well. You do not have to live with discoloration, chips, or other flaws. You can get the smile you have always wanted in as little as two appointments with porcelain veneers in Ft. Collins. Dr. Shiloh D. Lindsey will transform your confidence and your teeth using a minimally invasive procedure. Porcelain veneers are thin shells bonded to the front surfaces of your teeth to instantly cover cosmetic issues. When compared to those made from other materials, porcelain is the preferred material. Not only does it closely mimic enamel to look natural, but it also allows the veneers to be thinner. This requires less of the tooth’s structure to be removed during the bonding process to make the treatment minimally invasive. Drastic improvement to the appearance of your teeth. Maintains more of your tooth’s structure. Veneers are quite versatile, allowing them to resolve several issues that cause you to feel insecure, such as stubborn tooth discoloration that will not respond to traditional whitening treatments. Your teeth will become several shades whiter and stay bright because porcelain is stain-resistant. They are the perfect option to treat chips, cracks, or shorter than average teeth. In some cases, they can even be used as an alternative to orthodontics. Veneers can cover minor alignment concerns to give you a straight smile without having to spend months wearing braces. To benefit from porcelain veneers, you will need to schedule a consultation with your cosmetic dentist in Ft. Collins, Dr. Lindsey. She will ensure your teeth are healthy to support the veneers. Based on the results you want to achieve, she will create a customized treatment plan to enhance your smile. 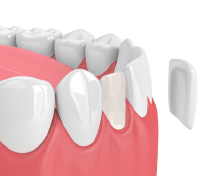 After preparing your teeth by removing a small amount of enamel, digital impressions are taken to design your veneers. They are crafted to match your exact size, shape, and color needs to give you the smile you have always wanted. Your new smile will last an average of 10 years before needing to be replaced. To protect the longevity of your veneers, it is best to use nonabrasive dental products to prevent scratches from developing on their surfaces. Brush your teeth twice a day and floss every night before going to bed. Do not forget to visit your dentist twice a year for a cleaning and checkup. Although veneers are durable, they can break. To prevent damage, do not use your teeth as tools to open packages or chew on inedible objects, like your nails or pens. If one should chip or crack, Dr. Lindsay can replace it. Get a picture-perfect smile today with porcelain veneers. Contact our office today to schedule your consultation.